Wisk yogurt, lime juice, and hot sauce together. Refrigerate until ready to use. Layout tortillas. Spread 1 #40 scoop yogurt sauce on each tortilla. Place 3 slices turkey breast and 3 slices turkey ham on each tortilla. Spread 2 #40 scoops guacamole evenly over meat. Sprinkle with 1 tbsp. diced tomatoes and top with ½ c. baby spinach. 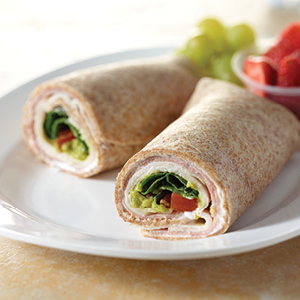 Roll tortilla tightly around turkey and vegetables. Wrap and hold at 41°F until service. MEASURE: 1/2 c. 2 tbsp. MEASURE: 2 qt. 1 c.
MEASURE: 1 gal. 2 c.
1 serving provides 2 oz. meat/meat alternate, 1½ servings bread/grain, and ½ cup vegetable (¼ c. dark green, ¼ c. other). Greek non-fat yogurt, plain 1 qt. 2 c. 3 qt. Lime juice 1/2 c. 2 tbsp. 3/4 c.
Hot sauce 3 tbsp. 1/4 c. 2 tbsp. Tortillas, whole grain, 8" 50 ea. 100 ea. All Natural Oven Roasted Sliced Turkey Breast, #2318-18, thawed 4 lbs. 12 oz. 9 lbs. 8 oz. All Natural Uncured Turkey Ham, #2568-18, thawed 4 lbs. 12 oz. 9 lbs. 8 oz. Guacamole, prepared 2 qt. 1 c. 1 gal. 2 c.
Tomatoes, diced 3 1/2 c. 1 qt. 3 c.
Baby spinach, RTU 4 lbs. 8 lbs.